Lacquer has been known as a traditional material of Vietnamese painting and used in the visual arts since the early 20th century. Nowadays, lacquer still has an important position in Vietnamese art. Currently, in addition to traditional lacquer painting, this material has appeared in many other forms of art such as sculpture, design or most recently the art of installation. Lacquer with installation art is a fascinating combination between a transformative material (lacquer, when mixed with other substances, will create different effects) and an art form characterized by synthetic language (installation art is suitable for most of types and materials). The artists also took advantage of traditional elements of lacquer and contemporary breath of the setting to create highly visual effects and bring artistic value to Vietnamese artworks. 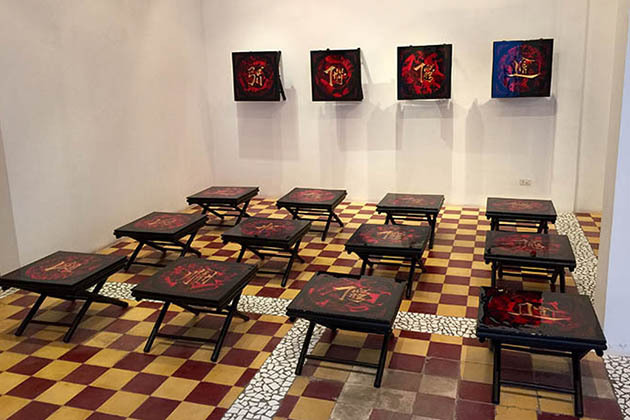 While lacquer is a material that has been attached to Vietnamese visual art since the early 20th century, installation art has only been known in Vietnam since the early 1900s. With its “temporary” feature, installation art also denied the importance of preserving in the museum and redefined the notion of artistic value. On the other hand, lacquer is considered a noble material. Since ancient times, lacquerware has been chosen to decorate worship items by its solemn appearance and sustainability. It is also used for the use of buildings and houses of feudal class to show their wealth and power. Nowadays, the splendor and national identity of this material make lacquerware chosen for display in many important projects of national stature. 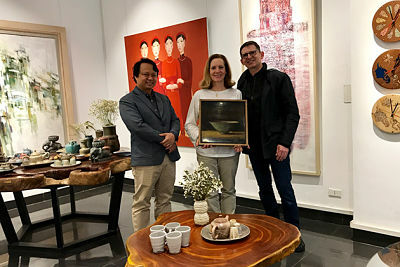 Although lacquer and installation seem to be two different extremes, the artists can still find the way to harmonize them and create Vietnamese artworks that are both traditional and modern. The concept of “traditional lacquer” here can be understood as a common lacquer, that is, to coat the paint and apply the coloring technique on the wood material. With these Vietnamese artworks of this type, lacquer plays a key role and are combined with other elements, which maybe auxiliary materials or space, light, sound and to make up the completed artworks. At this time, the artists focus on the process of decorating, grinding technique and polishing aimed to create the visual effect. Depending on the idea of the artists, lacquer material is used as the main element or the decoration part of the artwork. 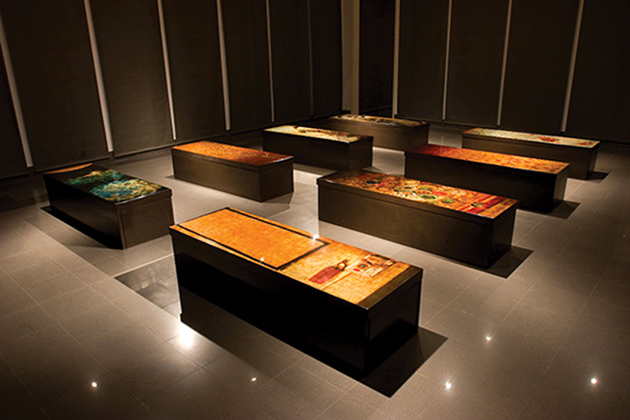 Some of the lacquer installation artworks can be mentioned as “16 Coffee Tables” by artist Nguyen The Son. The image of the tables is inspired by the tables in the Vietnamese coffee shop. On each table is a stylized gold letter in Chinese style which symbolizes the diplomatic relation between Vietnam and China. 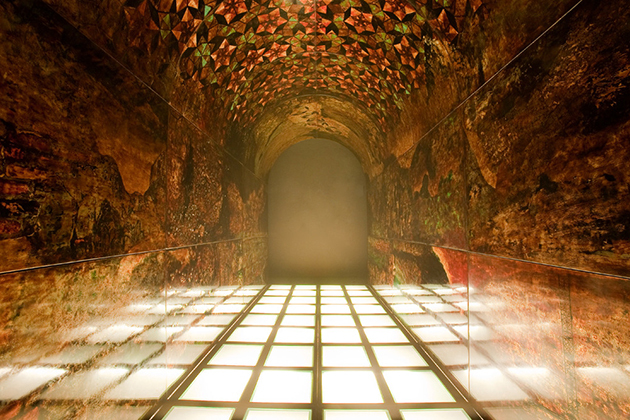 Lacquer has been transformed to become harmonious with the liberal of installation art. 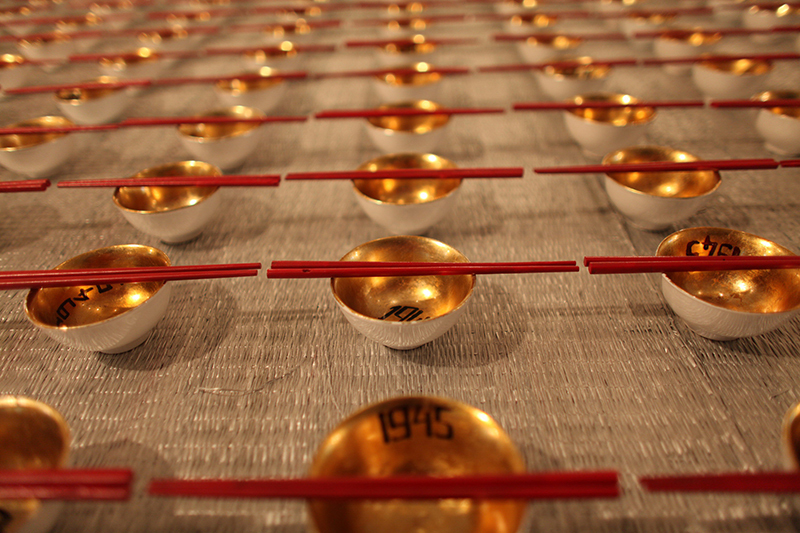 Another artwork is “The bowl and the chopstick” by the brothers Le Ngoc Thanh – Le Duc Hai at the exhibition “Numbers” (NSAF, Hue, 2011) made by many lacquer bowls with the red chopstick on them, creating a sense of fullness, as opposed to the memory of the 1945 famine. Some artworks by artist Phi Phi Oanh also follow this trend. Among them, the series of works at the exhibition “Black Box” at the Viet Nam Fine Arts Museum, 2007 are the most prominent. 16 lacquered boxes are very delicate and artistic with iridescent gold as the main color. The content expressed is the scene of everyday life of Vietnamese people. The use of lacquer in the installation is perfectly suited. It takes time and effort to make the color ingrain in the stature, which is in the same way as the image is screened out and imprinted in the subconscious mind of the human. Unlike traditional lacquer, experiential forms are the exploration of the new way of expressing the traditional material that the artists have successfully researched and accomplished. In this field, Phi Phi Oanh is considered the most successful Vietnamese artist. She has opened the new way for traditional lacquer. Some of the concepts created by Phi Phi Oanh are “lacquerskin” meaning lacquer painted on transparent plates or “lacquerscope” which means turning lacquer into a device and virtual images on the lacquer screen will be projected through the projector. The concept of lacquer on the traditional two – dimensional plane is replaced by a series of applications of this material with the help of science and technology. 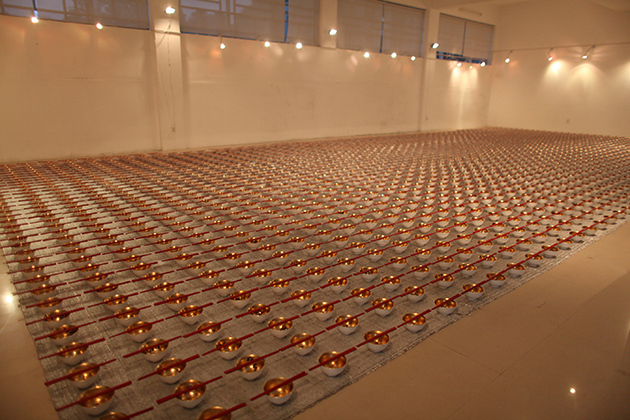 The first experiment of Phi Phi Oanh was presented at the exhibition “Specula – Reflecting Mirrors” (2009), which was later displayed at the Singapore Biennale 2013. 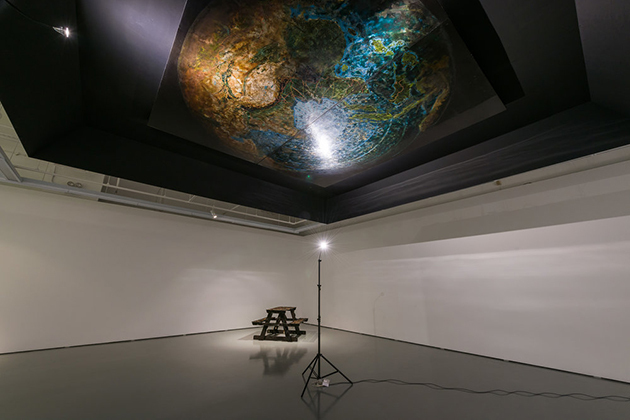 She surprised the viewer with a large lacquer dome, turning the artwork into an architectural arrangement. Replacing the wooden frame with a background made of fiberglass and epoxy resin, the artist created the huge curved surface for lacquerware, which has never been done before. Subsequently, the technique “lacquerskin” studied by Phi Phi Oanh for many years was presented at the exhibition “Parchmenter” at L’Espace in 2011. The lacquer is painted on the screening plates, combined with lacquerscopes to illuminate the image on the silkscreen sketching on the wooden frame. The arrangement of abstract images and modern machinery makes lacquer is not only traditional but also the material of the future. In general, the installation art combined with experimented lacquer fully exploited the value of lacquer along with the contemporary technique is a direction should be promoted. Through the examples mentioned above, it can be seen that the traditional lacquer material becomes the material suitable for the current trend of composing. The combination of lacquer and installation art has blown the new wind into Vietnamese painting, making it closer and more attractive to the audience.